Watts: You’re probably used to seeing Watt ratings on a number of household items. For instance, light bulbs have a watt rating – 60W for a standard incandescent bulb. Every device in your home operates within a certain watt range and that can help you pick which UPS to go with. VA: This rating is probably less familiar for you. UPS’s are often listed with their VA rating first and foremost. I’m convinced this is because the VA ratings are bigger numbers and so they look more impressive. The Watt rating is easier to size by, but the VA rating is the one usually shown in product names and advertising. In the case of either rating, these numbers tell you the maximum load the battery backup can handle without shutting down. If you buy a 500VA UPS and try to power a 1200VA device from it, it won’t stay powered up. As long as your devices have a combined wattage below that of the UPS, they can be powered. To be extra safe, you can do a little math and make sure the combined wattage is no more than 60% of the VA rating. However, most people want their equipment to remain powered up for more than just a few minutes in a power outage. Avoid going with a battery backup rated for “just enough” power. Just how high of a wattage should you go with? That depends on just how much run time you think you’ll need. Here’s a visual to make better sense of run times. In this chart is a UPS rated for 450W. Notice the right side of the graph. If the battery backup is running close to maximum load, you’ll only get a few minutes of time on battery power. Drop down to 1/4 or less of the watt rating, and you’ll end up with 20 minutes or more of run time. I wish run times were easy to tell just by looking at the watt ratings. Unfortunately they’re not. They vary from brand to brand, model to model. Manufacturers list rated minimum run times on their spec pages, but due to different testing processes these aren’t always accurate. If you’re up for doing some math, get a general idea of how many watts your equipment needs. If you end up picking a UPS rated slightly above that number in watts, you’ll get a few minutes of runtime. Just enough to cover a power flicker or to allow you to shut equipment down properly in an extended outage. Or, if you’d like your equipment to stay powered up for 15+ minutes, select a UPS with a watt rating around 4 times that of your devices. Too much math? To help pick a UPS size, I’ll group devices by how much electricity they draw. The higher the power usage, the higher the VA/Watt number on the UPS you should look for. Modem + Wireless Router – Internet service often will remain online during a power outage so long as you’re able to keep your network equipment powered up. Whether your modem and router are separate devices or combined, you can expect to be able to use them for nearly an hour with a low-capacity battery backup around 350VA to 425VA. Wireless Camera – First, make sure your other network equipment is protected from power outages so your connection stays online. The power draw of cameras is quite low at under 10W, so you can go with the smallest available UPS and still power a camera for an hour or more. Even a 125VA unit is plenty. Network Attached Storage (NAS) – Storage devices from Synology, QNAP, Buffalo, and other common brands are designed to draw considerably less power than a file server would. Power draw is largely dependent on the number of disks. Expect roughly 20W for the unit itself and about 10W per hard drive. 60W for a 4-disk system, for example. If you just need enough runtime to finish up a file transfer or save your work, a 450W UPS should be sufficient for all but the largest NAS. Alarm System – The control unit for an alarm system will become deactivated in the event of a power outage unless you plan ahead. This means if your electrical panel is accessible from the outside of your house, the alarm could easily be disabled by an intruder flipping a breaker. A battery backup will ensure the alarm system continues to operate. A small UPS will provide about 20 minutes of runtime, but I strongly recommend a 850VA unit or larger to allow for a 1 hour+ runtime. Video Surveillance System with DVR – A typical home or small business security system will consist of a control unit with video recorder and several security cameras which use power over ethernet (PoE). Protecting the entire system from power outages is easy since the cameras receive power from the main unit. The power needs vary depending on the number of cameras and the storage within the DVR, but you should expect between 40-80W of power consumption. With a 4-camera system, an 850VA unit should provide around an hour of run time. An system with 8 or more camera and RAID storage demands a 1000VA UPS to get near an hour of uptime. 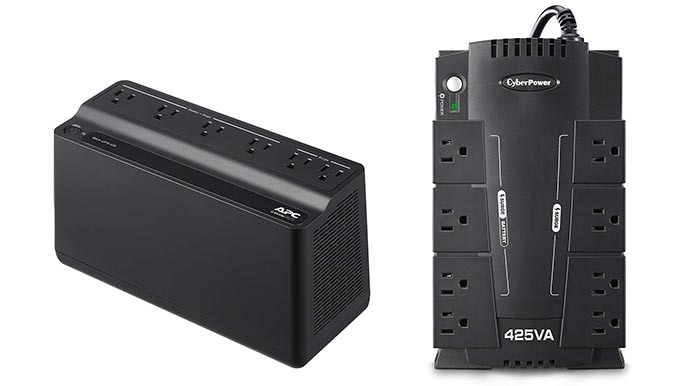 Whichever you go with, I recommend connecting the monitor/TV to a non-battery protected outlet on the UPS to maximize run time. PC, Mac, or Workstation – Expect around 150W of power draw for the average computer and monitor while in use. Higher-end computers will use far more power – plan on roughly 300W for a gaming PC or a workstation used for rendering, transcoding, compiling, or video editing. While a 550V UPS is adequate for a basic PC or Mac, workstation or gaming computer users would be best served by a 1000VA+ model. Game Console – At full load while playing 3D-intensive games, the Xbox One X and PS4 Pro usually pull around 150W. An LED or LCD TV may add anywhere from 50 to 200W depending on the size. I an outage hits and you want to ensure you can finish an online game or save your progress in single-player, you’ll want to look at a 1000VA+ model. Servers, Enterprise, and Medical Equipment – In these cases, I always defer to the manufacturer of the equipment you’re protecting. As uptime is business critical, don’t take any chances with compatibility. The hardware vendor will be able to recommend a UPS that has been tested and certified to provide power protection. 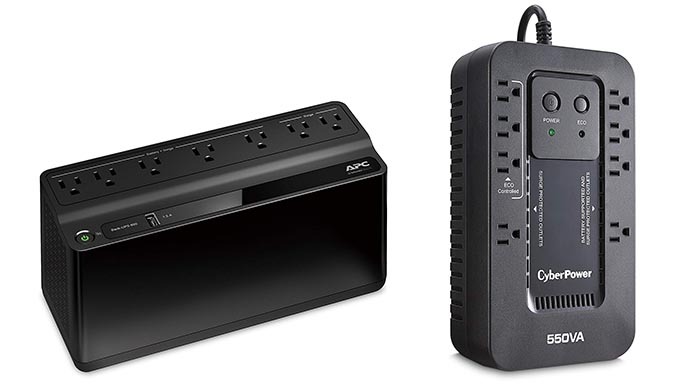 While a simple way to think of a UPS is a power strip with a battery, there are some extra features to think about. All battery backups have built in surge protection in varying levels. This will help protect your equipment from a power surge or a lightning strike. Joule ratings vary greatly. If you’re in a building which you feel is at risk for lightning strikes, opt for a higher rating. The same goes if your building has poor wiring or your electric company doesn’t provide the most reliable power. Whenever expensive equipment is connected to a power source, it’s good to have adequate protection. For computers, TV’s, and other pricey equipment, I recommend an 800 joule rating or higher. Some uninterruptible power supplies offer line protection for more than just your AC power. If you’re protecting your cable modem, TV, or cable/satellite receiver consider one with coaxial protection. This supplies “in” and “out” ports which offer line protection from surges. The most important use for this would be protecting the receiver and TV connected to a satellite dish. Similarly, phone and ethernet protection are available on some models. If you’ll be connecting a DSL modem, phone system, or ethernet broadband you should think about choosing a model that offers these ports. Most UPS’s have between 6 and 12 outlets. These outlets are then divided up between battery + surge and surge only outlets. Count how many devices you’d like to keep running during a power outage. When looking at a specific model, make sure the “battery backup and surge protection outlets” listed in the features is at least as high as what you’ll need. Also consider the surge only outlets. These are used for less important devices that don’t need to stay powered up in the event of an outage. Examples are fans, computer speakers, or lamps. Note that high-powered devices such as laser printers, space heaters, and paper shredders should not be connected to any ports on a UPS. Why would you bother with software for your UPS? If you have a server or computer with important data stored on it, safely shutting down is important to eliminate the risk of data loss. Some models include a USB port and cable which connect to your computer, along with software to install. This allows your PC or Mac to communicate with the UPS. It can either 1) safely shut down the computer immediately on power loss or 2) wait until the power has been off long enough to drain the battery to a certain level, then safely shut down. A basic UPS will simply use lights to tell you if it’s connected to AC power, running off battery power, or if there’s a problem. If you’d like more info at a glance, check out models with an LCD screen. It seems like one can never have enough USB chargers on hand. Some battery backups now include USB charging ports, so you can skip connecting the brick adapter and plug USB devices right in to power or charge them. What’s more is these are high-power ports: between 2.1A and 3.0A to allow for fast charging and high-power devices. This feature won’t be a deal breaker for most, but it’s a nice added bonus on some models. Like any rechargeable battery, UPS batteries have a lifespan. Most are rated for 3-5 years. In my experience that’s pretty accurate, with most needing to be replaced after 4-6 years of use in a climate controlled room. Aside from a few low-end models, replaceable batteries come standard. Even if you’re not very mechanically inclined, replacement is easy. First, disconnect power to the unit and remove the Phillips-head screw on the protective cover. Once open, disconnect the two battery terminals and remove the old battery. Reverse the steps with the new battery and it’s ready to go. Replacement batteries can be bought direct from the manufacturer, Amazon, or a local battery store. The cost is usually significantly less than the UPS itself. You can keep using the unit for many more years after a battery replacement since it’ll work like new. Will you be connecting a high-end PC, server, or sensitive equipment to the UPS? If not, you can safely disregard this part. Sine wave refers to the way AC power alternates between positive and negative. Pure sinewave battery backups smoothly make this transition. Certain electronics are sensitive and require this to avoid power loss when switching from AC power to battery power. Many power supplies in servers and higher-end PC’s use something called Active PFC to make them more efficient. However, this makes them more sensitive to power delivery. If you’re using a server or a PC that isn’t a low to mid-range prebuilt model, you should check the specs of the power supply to determine if it’s Active PFC. In my server troubleshooting days, I encountered a number of customers who purchased a simulated sinewave UPS for their server, only to find out it wouldn’t stay operational during an outage. If uptime is critical for your server, I recommend contacting the server manufacturer for approved UPS models. When you properly choose an uninterruptible power supply, it should give you adequate runtime in the event of a power outage. It’s important to know that a battery backup will not give you hours or days of runtime unless the equipment you’re running has very low power demands. If you need hours worth of operation for larger equipment, it’s best to look into a generator. What happens when a power outage begins and you have a UPS? You may hear a bit of a “click” followed by a hum when you start running on battery power. Most battery backups will also use an audible alert to let you know the power is out. This can be useful to let you know your time is limited and you may need to safely shut down the equipment after a while. If the beep of the audio alert becomes a nuisance, it can usually be silenced by pressing the power button briefly. If brownouts occur, you can expect to be protected from shutdowns just as you would with a full power outage. As mentioned early, you should never connect high-power devices such as a space heater, air conditioning unit, paper shredder, or laser printer to a UPS. In most cases this will result in all the connected devices failing to stay powered up. The life of the battery within the unit can be prolonged by keeping a few things in mind. First, the room should be kept at a comfortable temperature for best battery life. Beyond temperatures of 77°F / 25°C, the life expectancy of the battery starts to decrease. It’s also a good idea to avoid completely discharging the battery. If you have a long power outage, it’s best to shut down your equipment and turn off the UPS once it’s close to being drained. If you have a model with an LCD screen it’s easy to tell how much battery capacity you have left at a glance. For models with LED’s only, use your best guess based on the manufacturer’s runtime estimates in their specs. These devices are well suited for keeping several low-power devices online. Examples: a modem, router, NAS, wireless access points, DVR or TiVo, satellite receiver or cable box. While both units are rated at 425VA, the watt ratings are a bit different. The APC provides 225W while the CyberPower is a bit higher at 255W. Despite this difference, the APC model has longer run times. Expect about 35 minutes of runtime with 50W of equipment compared to 26 minutes with the CyberPower unit. If you’re living in an area where lightning strikes are a frequent occurrence, it’s important to pay attention to this rating. In these two models, we actually see a very large difference. The APC is rated for 180 Joules while the CyberPower is far beyond with a 890 J rating. It’s the clear winner here. Be sure to count the devices you plan to plug in. It’s also nice to have at least one of the non-battery protected outlets left unused in case you need easy access to plug in another device from time to time. The APC BE425M has a total of six outlets, with four of them providing battery power. The CyberPower CP425SLG has eight total, also with four on battery power. The spacing on the CyberPower’s non-battery outlets is far better. On the APC, you won’t be able to fit any larger adapters on the surge-protection only side. Smaller UPS’s such as these are pretty slim on features to keep the cost down. That’s not usually a problem with simple, low-power devices. Both have LED status indicators – on the power button of the APC, and next to it on the CyberPower. Audible alarms are included for on-battery, low battery, and overload. One key difference is the CP425SLG has a USB connection for a PC or Mac. By installing software and connecting the cable, you can configure your computer to safely shut down when the battery level reaches a certain point. Now, keep in mind the 255W power rating of the CyberPower unit is ok for a basic desktop computer, but not for a workstation or gaming PC. You’ll only get a few minutes of run time with a desktop. However, this should be just enough to safely shut down the computer and avoid possible data loss. Both units are very affordable and can typically found for $50 or less. As of this writing, the price is nearly identical for both models. Overall Winner: For run time, APC BE425M; for features, CyberPower CP425SLG. This APC is rated at 600VA compared to 550V for the CyberPower models. These units are well suited for desktop computers (Mac and PC included), alarm systems, and surveillance systems. You’ll notice the APC UPS is rated 50VA higher, though the watt rating of both is identical at 330W. While they’re rated very similarly, APC continues its trend of offering better run times compared to their ratings. Let’s look at a 100W load. This would be about average for an iMac or a desktop computer without monitor. The APC is rated for about 23 minutes of run time compared to 14 minutes with CyberPower – a pretty noticeable difference. Suppressing power spikes is an important part of keeping expensive equipment safe. APC offers a 490 Joule rating while CyberPower rates their model at 526 J. These ratings are close enough to effectively provide the same protection. The BE600M1 includes a total of seven power outlets, with 5 having battery backup. The footprint of this unit is smaller than the CyberPower due to all outlets being in a single row. One weak point of this layout is that the two surge protection only outlets are not spaced out, so one large AC adapter will block the outlet next to it. The battery protected outlets are well placed. The CyberPower EC550 has eight total outlets. Four are battery protected. The spacing of some of the outlets isn’t great, but the high number of outlets somewhat makes up for it. With this model, you’ll get one more surge-only outlet than the APC, but one fewer battery protected. Keep in mind how you’d like the majority of your devices to be connected, whether it be with or without battery protection. In this price range, you won’t find a great deal of features, but there are a couple of nice additions that separate these models. On the APC, you’ll find one USB charging port. It’s a 1.5A port, which isn’t quite enough for fast charging of phones and tablets, but does a bit better than a typical 5V/1A charger. If charging speed isn’t critical, this is a nice feature, letting you keep one fewer AC adapter on hand. It’s also handy for keeping your phone battery topped off in the event of an outage in case you don’t know when the power will be back on. Both models have a data port to connect to your computer. This, along with power management, can safely shut down your computer when the power goes out. The EC550G has one interesting feature that the APC does not – Eco Mode. This feature automatically cuts power to other devices when the main one is turned off, saving electricity. For instance, once your computer is shut down, it will disconnect power to your speakers and monitor. You can either enable or disable this option for the labeled ports by using the Eco button. At under $60, these UPS’s get you quite a bit more run time than 350-425VA models for a small price increase. Both units were nearly the same in price as of this writing. You might find that the addition of a USB charging port on the APC or the CyberPower’s Eco Mode makes stepping up worthwhile, even if your devices have a pretty low power draw. Extended run times and support for high-power devices come into play with 1000VA models. Stepping up to “compact towers” such as these also adds a lot of features. If you intend to power a workstation, gaming PC, game console, or a mix of electronics and network devices it’s a good idea to go with one of these UPS’s. We see identical ratings here, with both models rated at 1000 VA and 600 watts. As is the norm for APC, we see longer run times for any given load rating. With a 150W load, you can expect to get about 31 minutes of run time with the BX1000M versus 28 minutes with the CP1000AVR. The difference is bigger between the brands as loads increase. Chances are your equipment is pretty valuable if you’re looking into a UPS of this capacity. Surge protection is not to be overlooked when making your choice. Fortunately, both models provide strong power protection. The APC is rated for 1103 Joules while the CyberPower is at 1080 – effectively the same high level. APC goes with four battery protected outlets and four surge-only on this model. Spacing between the outlets is good. This allows for most AC adapters to be connected without blocking any outlets. CyberPower adds one more battery protected port. However, the spacing is pretty close, so AC adapters are likely to block adjacent ports. I’ve used power cable extenders in cases such as this, but it does add a bit to the overall cost. Full protection is the name of the game here. If you have a cable box, satellite receiver, or antenna, the coaxial connections will protect them from surges. For phone or network equipment, there are combo RJ-11/RJ-45 phone or network jacks. These connections are the same between both brands. These are fully featured battery backups. I think their best feature over less expensive units is the LCD screen at the front. LCD’s are great for seeing exactly what’s going on with your UPS at a glance. Both models display load level and battery capacity indicators at all times. There are buttons to cycle between the other display settings, including input voltage, power usage in watts, and estimated run time on battery power. Estimated run time is especially helpful. Without an LCD, you need to guess the wattage of your devices and estimate the run time based on the manufacturer’s chart. Most people place their UPS under a desk or behind furniture where it’s dark. When a front panel button is pressed on these units, they’ll light up so you can view them in the dark. The LCD’s on both the APC and CyberPower are equally readable and feature nearly the same settings. Sensitivity adjustment is the only setting that separates these two models, and it’s available on the BX1000M. This can be set to high, medium, or low depending on the quality of your input power. For instance, if your power quality is low and your connected devices aren’t sensitive to the fluctuations, low sensitivity will keep the unit from switching to battery power frequently. This helps maximize battery life. On the opposite end, setting it to high with sensitive electronics ensures your equipment will be shielded from small voltage fluctuations. Data ports are included on both models. This connection is combined with software on your computer. When set up, it allows for automatic safe shutdowns when the battery level drains to a certain point. If you are connecting a very old computer (think 1990’s), the CyberPower has a serial port in addition to USB – for most people this won’t be important. Hot swappable batteries are a feature of the APC UPS, but not the CyberPower. When it’s time to replace batteries, you can change them out on the APC and keep everything connected. On the CyberPower you’ll need to power down and unplug everything first. If you have equipment connected that must remain online 24/7/365 this is a nice feature. Moving up to a higher-power UPS with LCD comes with a jump in price from the basic models. Expect to spend a bit over $100 for a 1000VA model. In this case, the BX1000M runs about $15 more. Whether the APC is worth a bit more to you depends. If the added run time, sensitivity adjustment, or hot swappable batteries is important, I think the slightly increased cost is worth it. 1500VA UPS’s have a full set of features and are a great choice for long run times and connecting a large number of devices. Ratings are the same at 1500VA / 900W on both models. Battery run times differ between the two. We see CyberPower come out ahead, which is the opposite case from lower-powered units where we see APC excel. With a 200W load, you’ll see about 31 minutes of battery power on the APC compared to 36 minutes on the CyberPower. With pricey equipment connected to your battery backup, it’s important to protect from power surges. All UPS’s have power protection, but the level varies by model. In this case, the BX1500M has a 789 Joule rating, which isn’t bad, but it’s on the low side for a 1500VA UPS. The CyberPower is rated at 1500 Joules. If power surges or lightning strikes are common in your area, or your connected equipment is very costly, opt for a high surge suppression rating. APC has 10 total outlets, with half being battery protected and the rest with surge protection only. A bit of extra space is given between each outlet, so some AC adapters may fit without blocking the adjacent outlet. CyberPower’s 1500VA unit has 12 total outlets, with half being battery protected as with the APC. Two outlets have large spacing for big AC adapters, while the rest are pretty close together. In most cases, the CyberPower will let you connect two more devices than the APC. LCD screens are included on both brands to view settings. This is an important feature to have. It allows you to keep track of the battery capacity, load, and estimated time on battery power. Settings are nearly identical between these two models, with both featuring a backlight in case the UPS will be set up in a dark area. The APC unit has just a couple of extra features that the CyberPower does not. The batteries can be hot swapped on the BX1500M, so your equipment can remain on during a battery replacement. A sensitivity setting can be configured and viewed on the LCD. This allows you to fine-tune how the battery power takes over during high, medium, or low power fluctuations. Data ports are included on both models. Along with the provided software, this allows for safe shutdown of computers when the battery reaches a certain level. Overall, features and settings are very similar on the two models, with the APC offering just a bit more. The cost of 1500VA UPS’s has come down over time. Not too long ago the prices were close to $200. Lately, they’re closer to $150 or just beyond. In the case of the BX1500M and CP1500AVRLCD, prices are very close. The CyberPower usually does cost about $10 less, so it’s a slightly better value. Most 600VA and higher battery backups can communicate with your computer. This allows your computer to safely shut down and avoid data loss. Here’s how it works: on models with a data port, software and a USB cable is included. After installing the software, you connect the USB cable between the UPS and your computer. The software then knows the status of the battery backup – whether it’s on battery power, what the load is, and what the battery capacity is. When an outage occurs and the UPS goes to battery power, it will safely shut down the computer. You can either set it to shut down right away when the power goes out to save battery, or you can maximize run time and have it shut down only once the battery gets low. Either way, an abrupt power loss to the computer is avoided. 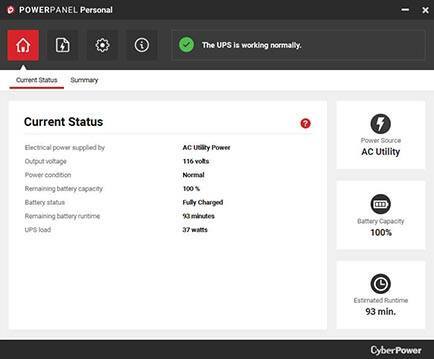 APC and CyberPower each use their own UPS management software to talk with the connected battery backup. I’m going to compare the settings and features of the software by both brands to see if one stands out. Installation of both applications is very straightforward. Other than checking a box for the licensing agreement, you can click “Next” through all the installation steps and accept the default options. After installation, you’re greeted with the home page for the software. The interface of CyberPower’s software is cleaner and more modern, while APC’s looks like it belongs back in the Windows XP days. Two status screens hold most of the import UPS info with both brands. APC’s history screen, titled “Performance” offers nearly identical info compared to Cyberpower’s “Summary” tab. You can view how many times the UPS was on battery power and for how long, along with over and under voltage events. The most frequently used tab is the “Current Status” view for both brands. This gives you all the realtime details you’ll need. Battery charge and estimated runtimes are clearly displayed. A standout feature for APC is a bar showing the battery load. 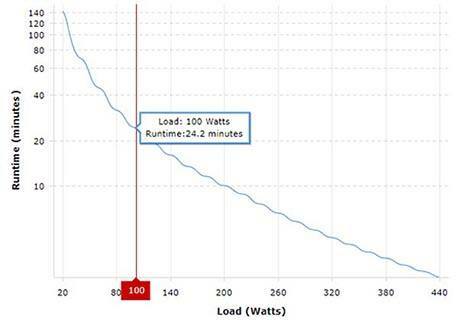 This green bar shows how many watts of capacity are being used, with the total load capacity shown at the end of the bar. 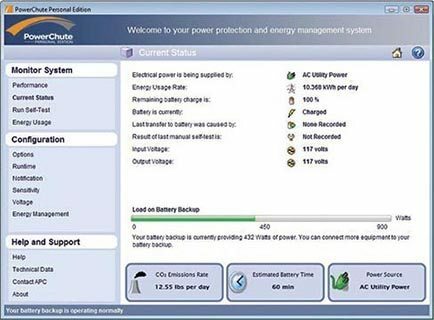 CyberPower’s software is missing the total capacity. It’s much easier to power up a device and see the impact on the load with APC’s software. In terms of settings, I found the software to be largely the same. Another setting you may like to use is the Notification feature. Both programs can be set to send you an email when the power goes out. This can be very handy for informing you of outages if you’re away from home or the office. Summing this up, my preference leans slightly toward APC since the bar showing power load is so handy. If you’re under the desk plugging in another device, it’s easy to peek up at the monitor and see the impact. However, either brand will do the trick. Installation is simple. They both let you keep an eye on what’s happening with the UPS. You can view past power events. Configuring what happens in an outage is quick and easy. Both APC and CyberPower have a 3 year warranty. This includes the UPS itself along with the battery, and applies to all models. There are a few things to keep in mind when making a warranty claim. You should keep the receipt from your purchase to prove the battery backup is under 3 years old. Advance replacement is not typically offered. That is, you must first ship your UPS back to the company before they will replace it. The shipping cost of sending back a failed UPS must be paid by you in most cases. APC and CyberPower will pay to ship the repaired or replaced unit back to you. Keeping those things in mind, the warranty replacement process is pretty painless with both companies. APC and CyberPower offer coverage for devices connected to their UPS’s. If a surge hits and your equipment becomes damaged, you may be entitled to replacement costs. 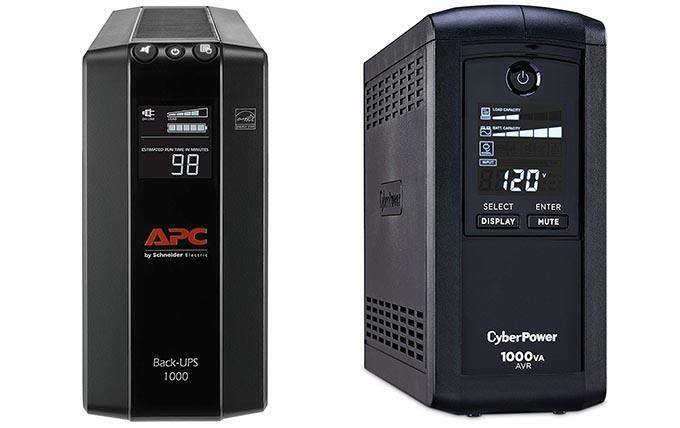 APC and CyberPower UPS’s under 1000VA typically offer up to $75,000 in replacement value. 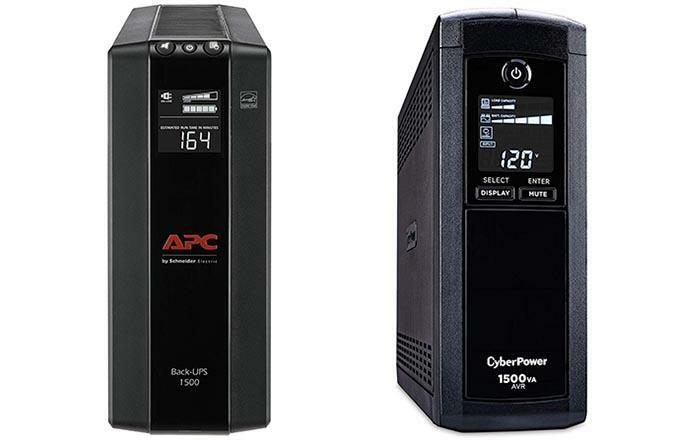 Moving up to 1000VA units, APC’s most popular model has $250,000 of coverage compared to $350,000 with CyberPower. At the high end of consumer models with 1500VA, APC offers the same $250,000 coverage while CyberPower ups it to $500,000. Be sure to read the equipment protection policies from APC and CyberPower if this coverage is important to you. There is a lot of fine print on what’s covered and what’s excluded. My best advice to prep for a future claim is to keep receipts for all of your connected devices along with the receipt and manual for the UPS. Also, be sure to follow the instructions exactly. Connect the UPS directly to the wall outlet and not into a surge protector. Be sure not to overload the UPS. APC’s steps for filing an equipment protection policy claim can be found here. For CyberPower, you can find the claims contact info here. APC and CyberPower are two great brands and you can’t go wrong with their products across the board. They both have good warranties and fair prices. Refer to my side-by-side comparisons above to help pick the best UPS in the capacity you need.